December has finally arrived. While this year slowly eases into the next, most folks feel they need to spend every free moment preparing for the holidays, usually through epic feats of conspicuous consumption. But there is another way! The best gift you can give your loved ones is to enter the holiday season as friendly, caring, and relaxed as possible. The most expedient way to accomplish that, believe it or not, is to pay attention to the natural world. That’s right! Professor Richard Ryan from the University of Rochester (go, Flour City!) conducted research that revealed that people exposed to natural elements rated close relationships and community higher than they had previously. You probably knew that already, didn’t you? So where will you be this weekend and will you be enjoying nature? Share your plans in the comments below. Charlie, Corey, and I will all be catching what brief glimpses of birds we can this weekend. Don’t get the idea we’ve all abandoned birding; instead, imagine that we’re each laying the groundwork for more ambitious avian excursions down the road! Oh to be back in Jamaica’s Blue Mountains! Beautiful mountains there and great skies. Such blue, blue mountains–how could you not miss them! I’m watching the water birds because almost overnight our lakes are starting to freeze. it’s always feel good to see mountains!we lived in singapore for 4 years and couldn’t find anything like this! great to be back to philippines, too! thanks for this shot! Happy skywatching and happy weekend! This will be my first weekend to get out in ages. I hardly know where to go first, but at least that means there’s a lot I haven’t seen. Ahhh..to be in the warmth in Jamaica. I didn’t realize there was such beautiful mountain scenery there. Have a marvelous weekend! 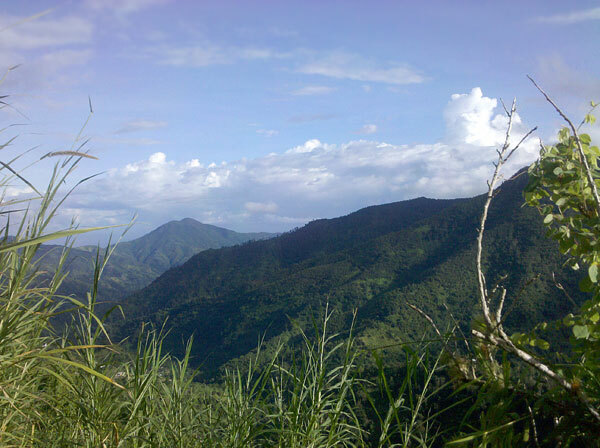 Wow, great scenery, i never knew jamaica has moutains like this, great!!! What a beautiful scenery – reminds me of the alps. @Wren: yes, absolutely, you poor soul in A2, so much to do in so little time. If I were you, I’d check the Arb in the early morning, then head down the Huron to Gallup park, go for lunch at Briarwood Mall to see what the Belted Kingfishers are up to, walk a few rounds through Dolph during the early afternoon and finish off the day winterbirding along Gooding and Hitchingham Rds between E Willow and Milan Oakvill Rds or alternatively in Superior Township. If you were me, you’d be glad to push a stroller through boring fields between Nussloch and Leimen here in Germany. I’m going in search of the Ash-throated Flycatcher in Queens if it sticks. I imagine the landscape will be considerably less serene and beautiful that that pictured above. Oh what a lovely scene! Jamaica’s Blue mountains are beautiful!